University Housing looks forward to welcoming you to your campus home, Mustangs, and we've planned the big move with your convenience in mind! First-year & transfer students move in Friday & Saturday, Sept. 14-15. Both days are "assisted" move-in days with the Mustang Welcome Team available to direct you to your drop off zone and long-term parking and help you unload. Parent & Supporter Orientation Sessions will be held in each first-year community at 2:00 p.m. on both Friday & Saturday, Sept. 14-15. Specific location information will be posted around each first-year community. Tip! Wow grouping starts the morning of Sept. 16. Continuing Students move in Sunday, Sept. 16 - Wednesday, Sept. 19. Sunday is an assisted day. Monday - Wednesday are self-guided days. All students must have a Mustang Move-in Pass for move-in on the dates noted above. The pass is secured by signing up for a required move-in arrival date and time for vehicle unloading, check-in and long-term parking. Students will be emailed a link to secure a pass in August. Tip! 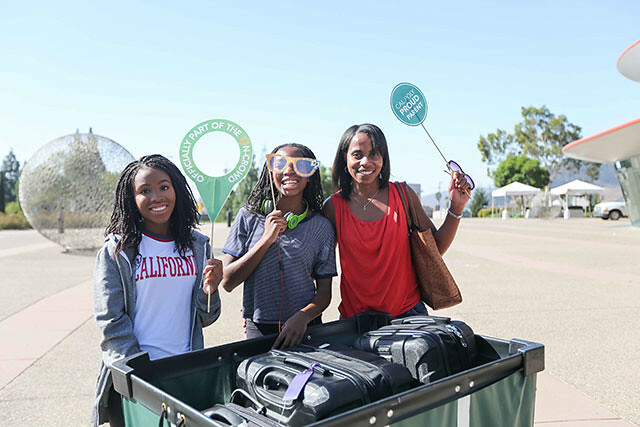 This year, new students will be assigned a WOW check-in time based on the move-in arrival time. Students who are required to be on campus before the published fall move-in dates are eligible for early move-in through formalized agreements with campus programs. Early start programs participants will be emailed move-in dates and instructions in August, after all student rosters are finalized. Early Start Programs participants do not need a Mustang Move-in Pass. No one likes long lines and traffic delays. To ensure a convenient move-in experience, we've designated campus entry points based on living community. The campus entry point for students living in yakʔitʸutʸu, and Sierra Madre & Yosemite Halls is Grand Avenue. Use the Grand Avenue Move-in Map. View the Grand Avenue video. The campus entry point for students living in the South Mountain (red brick) Residence Halls, North Mountain Halls, Cerro Vista Apartments and Poly Canyon Village is Highland Drive. Use the Highland Drive Move-in Map for New Students or the Highland Drive Move-in Map for Continuing Students. You can also view the Highland Drive video. Maps will also be emailed to students prior to Move-in. Tip! Campus housing is located on hilly terrain. Be prepared to climb stairs, and remember that September days on the Central Coast are warm. Consider bringing comfortable shoes, a hat, sunscreen and water. Please leave pets at home. Don’t bring your entire room with you. You always have breaks to get things from home or have things shipped to you. Take a look at the "Free to Bring" suggestion checklist, and talk with your roommates about items to share. Please leave prohibited items at home. Recent updates: Medications and First Aid was updated & U-locks were added. Save money on campus living items. Avoid extra trips to retailers. Reduce packaging waste from online shopping. Buy from the CP Thrift Fair at Mustang Move-in! College supplies & household items collected from the Cal Poly community last fall will be available to new and returning students. Items will be offered with a suggested donation to help fund future eco-friendly projects through the Cal Poly Green Campus Sustainability Fund. All transactions will be processed through Venmo. Create an account now, so you're ready to shop when you arrive. Reduce your carbon footprint; shop CP Thrift! Need to mail your belongings to Cal Poly? Distribution Services begins accepting packages for residents Tuesday, Sept. 5, 2018. Tip! Consider using UPS or FedEx to ensure efficient tracking and delivery of your packages.